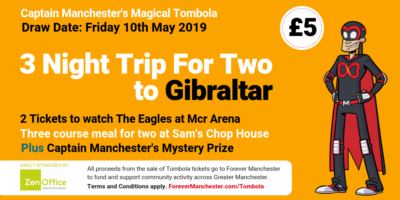 Forever Manchester has teamed up with XS Manchester 106.1FM to help promote all the great stuff that Forever Manchester does to support community activity across Greater Manchester. As well as airing our 10 second and 60 second adverts, XS Manchester will also be working closely with Forever Manchester to help promote our fundraising activities and showcase the work we do in communities across the area. The radio adverts which will be played every day on XS Manchester take the form of a poem, with upcoming local comedian Rachel Fairburn providing the voice over. 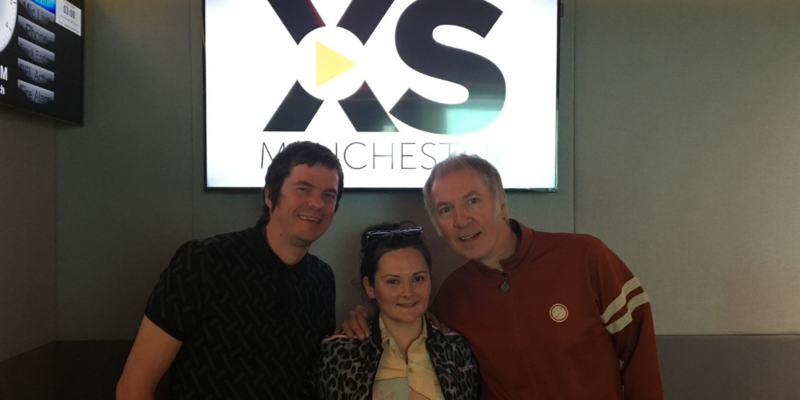 Rachel (pictured above with Forever Manchester’s Paul Haworth and XS Manchester’s Clint Boon) was brought up in Harpurhey, North Manchester and was one of the comedians that performed at Forever Manchester’s charity comedy night in November 2018. Rachel is also co-host of the huge podcast ‘All Killa, No Filla’ , creating a massive cult following with fellow comedian, Kiri Pritchard-McLean. In November 2018, we caught up with Rachel as part of our very own ‘Forever Manchester Meets’ Podcast Series. Click here to listen to Forever Manchester Meets.. Rachel Fairburn. From and just for Greater Manchester, XS Manchester is passionately Manchester – music, fun and football. XS Manchester is available across Greater Manchester on 106.1FM, online and app. XS Manchester reaches 90,000 adult listeners a week. The radio station is part of the Communicorp UK Group. Source: RAJAR/Ipsos-MORI/RSMB six months ended December 2018 within the XS Manchester TSA. To assist in the launch of the partnership, XS Manchester DJ Clint Boon invited Paul Haworth, Forever Manchester’s Director of Brand and Strategy, to submit his ‘MyXS’ playlist of top tunes which featured on XS Manchester between 2pm and 3pm on Friday 12th April, prior to Clint Boon’s #ThatsGoodInnit Drive show. Forever Manchester’s links to XS Manchester DJ and Inspiral Carpets keyboard player, Clint Boon, stretches back as far as 2012, where Clint helped to launch our Manchester Music Amnesty to raise money for Forever Manchester. Over the years Clint has drank cocktails, signed T-shirts and artwork took part in our Higher Lower game to help raise awareness and money for Forever Manchester. In February 2017 Clint was the DJ at our Annual Birthday Party at the Principal Manchester which raised over £45,000.